The property you were looking for sold. Use these tools to continue your Calgary home search right now! Find out how much the property was sold for and the sold prices for other homes in the community with our interactive market reports. These detailed reports include original listing prices, sold prices, days on the market and more! Begin your Calgary home search by choosing the quadrant you prefer. Get a description of each community along with all the homes for sale in the community. Contact us anytime with any questions about Calgary homes for sale. 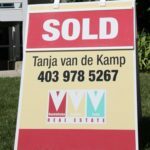 We are here to help you find the perfect Calgary home, no matter if this is your first home purchase or your tenth.